The opening of the LudoBites reservation line has become an increasingly stressful time. How long will it take? Will I even get one? I set up a calendar invite on July 14th at 4pm with a number of my co-workers. 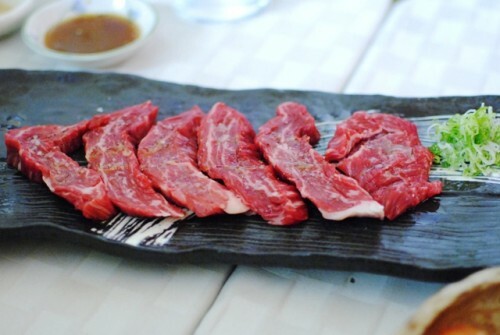 No distractions…one goal in mind: make a LudoBites reservation. Luckily, I got one and so did one of my co-workers. He can’t go anymore and has graciously donated the reservation to be given away. The reservation is for the first seating of the first night of this LudoBites (ie. 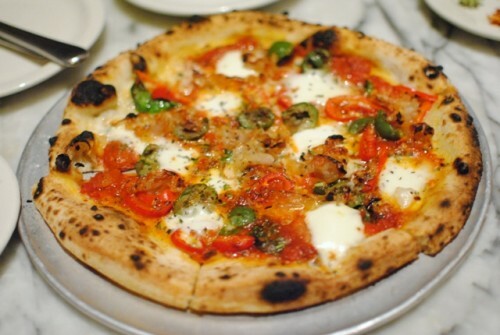 you’ll be one of the first people to try Ludo’s food this time around). This has been pre-approved by Krissy, so the reservation should be seamlessly transferred. I’m trying to keep it really simple. Please leave a comment with what dish (hypothetical or real) you’d like to see at the next LudoBites. 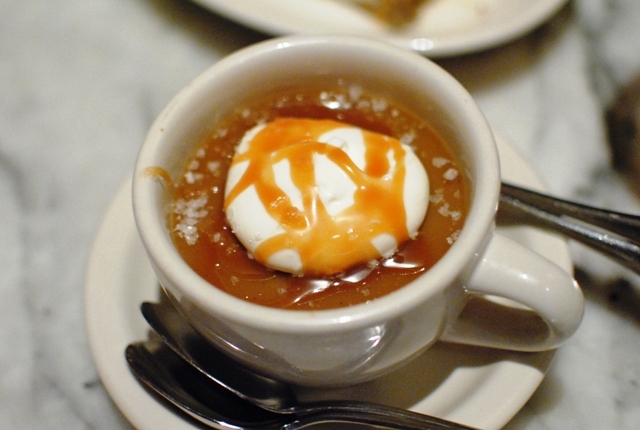 Bring back the caramel souffle with fleur de sel ice cream? Or maybe some of the barbecue he learned in Raleigh? How about a foie gras ice cream? Leave your name and e-mail address so I know how to contact you. Deadline to enter is Sunday at noon. I’ll have my co-worker pick the best entry (it is his reservation after all) and the winner will be announced Sunday afternoon. That’s it! Any questions – I’ll address in the comments. Good luck! Thank you to everyone for their comments. 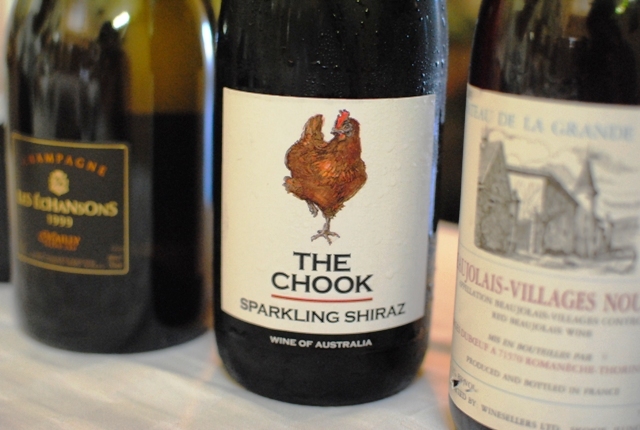 There were a lot of great ideas; clearly, foie gras is the most popular (and controversial?) ingredient in Ludo’s repertoire. We especially loved Wes P’s suggestion of the foie gras steamed bao, Dan Cox’s Elvis-inspired peanut & uni pop with freeze-dried banana, and even chubbymeat’s brazen challenge to cook a particular type of offal. It was a very difficult decision (I wish we could’ve given away a dozen more reservations! ), but Aly Rizzo’s suggestion of bringing breakfast to LudoBites was a unique one, and the idea of a “Ludo-fied” eggs benedict utilizing a honey-lavender biscuit was enough to get our appetites going! So, congratulations to Aly Rizzo on winning the reservation! I’ve wanted to visit Gjelina for some time now…though, not enough to drive all the way across town. Until now. Opened in 2008, Gjelina has been consistently popular during its lifetime. So popular, in fact, that when making a reservation two weeks in advance, only 6pm and 9pm were available on a random Wednesday night. Consider my interest piqued. 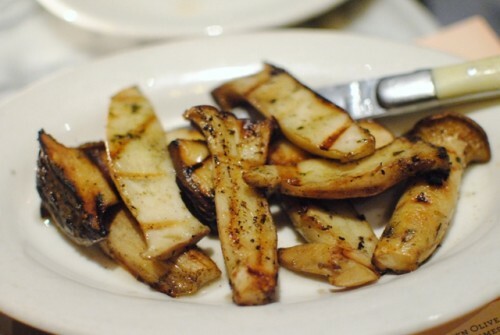 We started with these large mushrooms, grilled to a nice char. 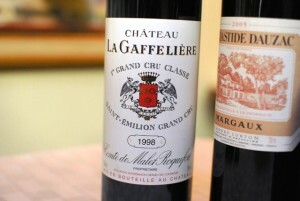 Smoky and earthy, they were really heightened by a touch of lemon. I thought this dish was very ordinary. The fish was fine, but the accenting chili, cilantro and lemon were too subtle. 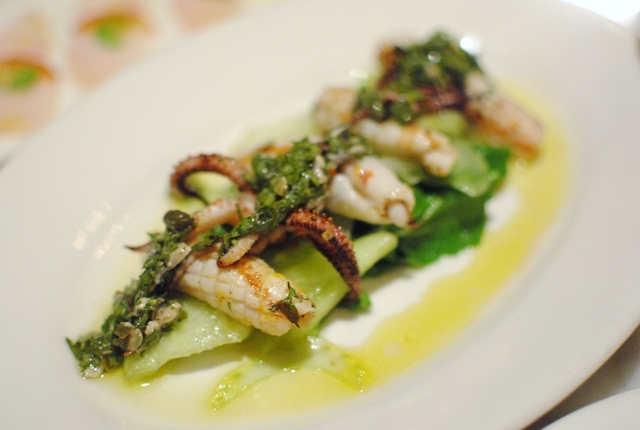 I liked this dish – tender squid was paired with a little sweetness from the melon, while the chili and salsa verde brightened the dish up. 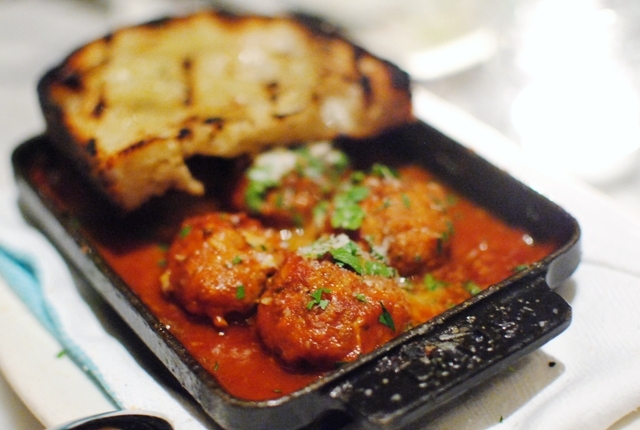 These were solid meatballs in a hearty and rich tomato sauce. An excellent dish. The pork was crispy on the outside and meltingly tender on the inside. I liked the addition of the polenta and greens, adding some earthy undertones while the cider helped to cut through the richness of the belly. This tasted pretty much as advertised, though I was missing some of the pancetta flavor in the vinaigrette. 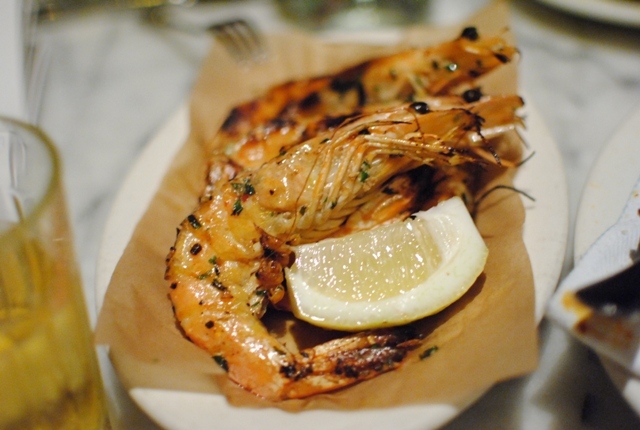 Possibly my favorite dish of the night, large prawns came out perfectly roasted. 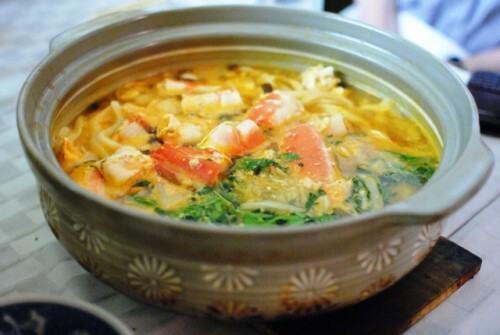 Slightly smoky and slightly spicy, the accompaniments accentuated the shrimp without overpowering. Another hit, this mushroom toast was pretty delicious. 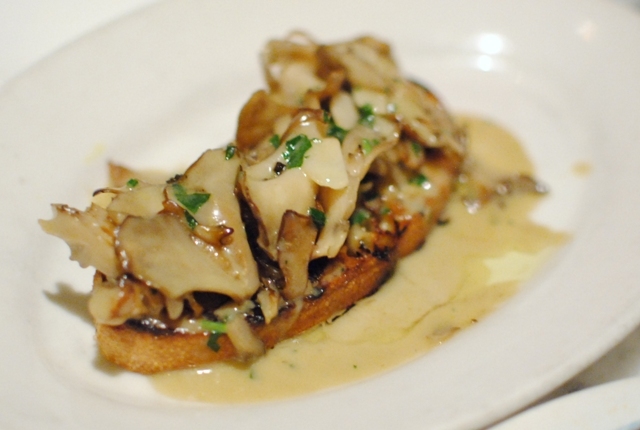 The tender mushrooms went well with the tart crème fraiche and crusty bread. This was our only large plate (the kitchen closed this section of the menu without prior warning) and it was a disappointing one. The lamb was surprisingly dry and overcooked. Not sure what happened here. 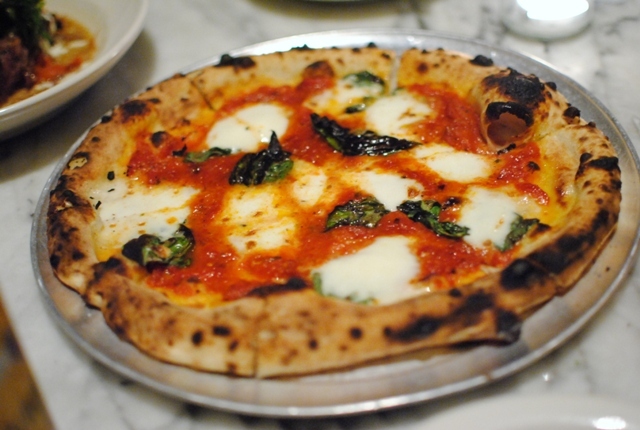 This was a good pizza with a sweet tomato sauce and a soft, chewy crust. I might’ve preferred it to be a little more crispy on the bottom, though, as it seemed somewhat soggy in the middle. Good, but not particularly memorable. This pizza definitely had a more dynamic flavor profile than the Margherita, with a tasty, meaty pork flavor complemented by heat from the chili and saltiness from the olives. Pretty nice. Seriously delicious. I thought it was rich (but not overly so) with a really nice depth of flavor. A little bit of salt and whipped creme fraiche were simple and integral accompaniments. While I preferred the other dessert, this one held its own. Small chunks of banana filled the pie, which benefitted by being not overwhelmingly banana-y. 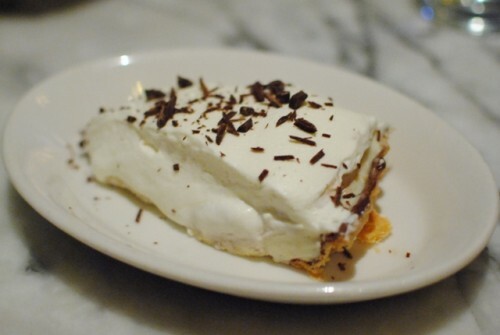 The cream was pretty light with just the right amount of sweetness. Gjelina met my expectations (which were pretty high). 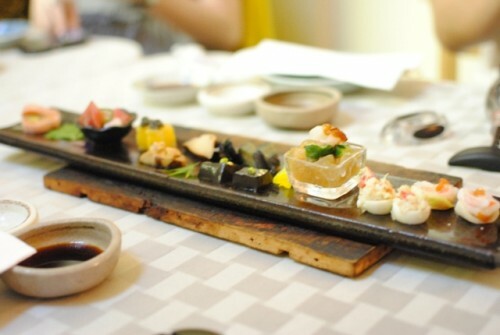 Most of the plates managed to be interesting and different while staying within familiar Italian flavor profiles. 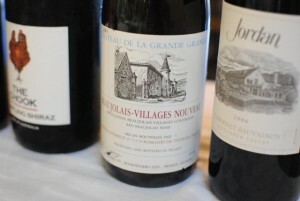 The place is definitely trendy but with proven staying power. I can’t say I’d make a special trip to Venice just to eat here, but it’d definitely be a strong option if I were in the area. 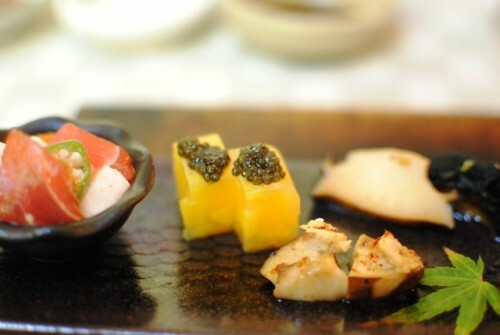 I first went to Totoraku last August but had yet to return. 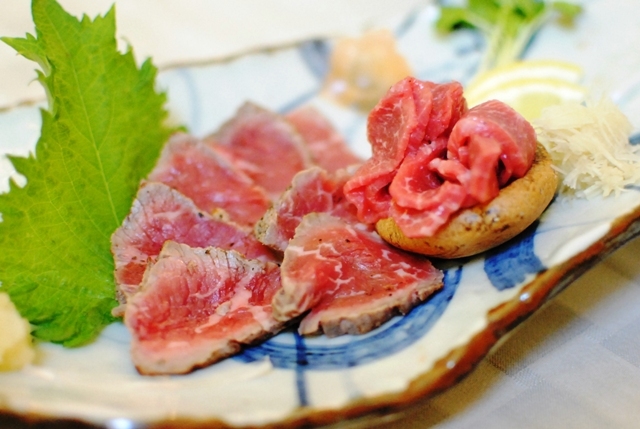 The “secret beef restaurant,” reservations can only be made by those who have gotten a business card from the chef. I am not one of those people. However, I had the privilege of taking part in someone else’s party of six. There is no menu; rather, the food just comes out of the kitchen unprompted. 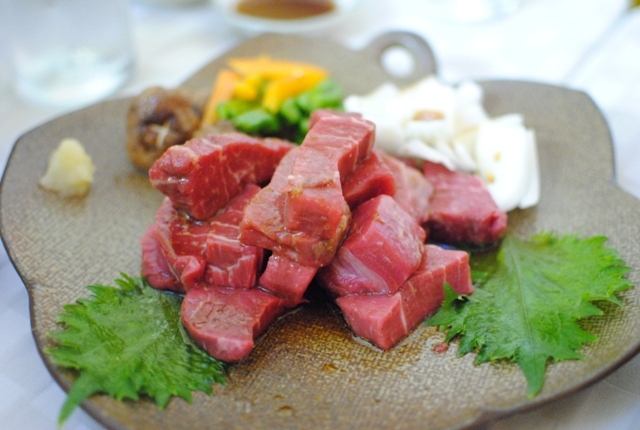 The meal tends to follow a basic progression: appetizers, raw beef, cooked beef, soup and ice cream. Unfortunately, I didn’t capture what any of these were. 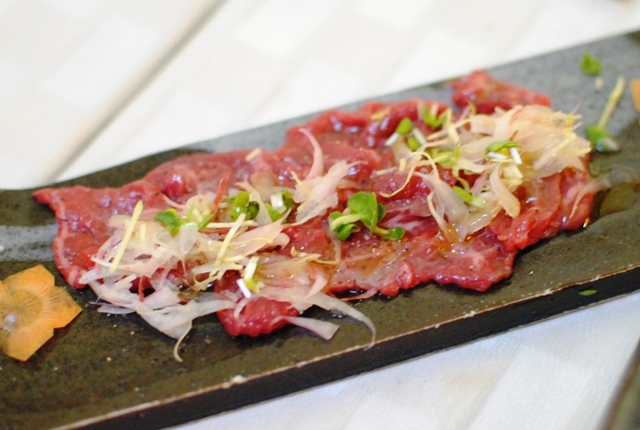 Totoraku’s appetizers are very different from the rest of the meal, providing light amuse-bouche type bites as a precursor to the plates of rich beef to follow. 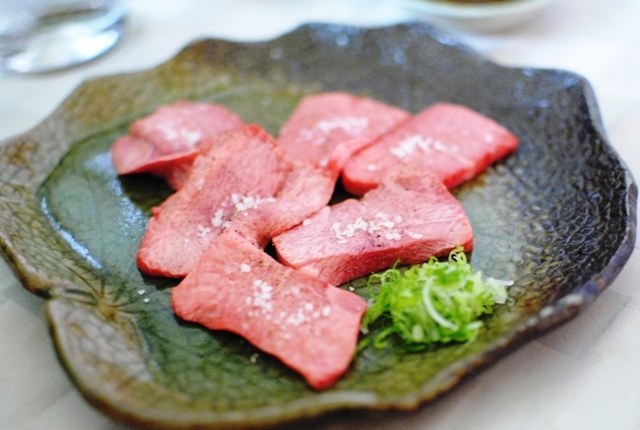 The first few beef dishes were all raw. 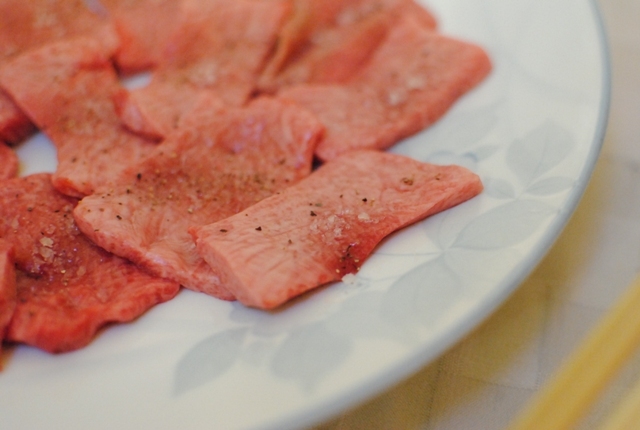 Here was a carpaccio, heightened by some onions and garlic. There was a slight sweetness too, but the beef was definitely at center. The ribeye was solid but rather ordinary; the throat was a big highlight. I don’t think I’ve eaten throat anywhere but here, and it makes me wonder if most cow throats go straight to animal feed (or hot dogs?). 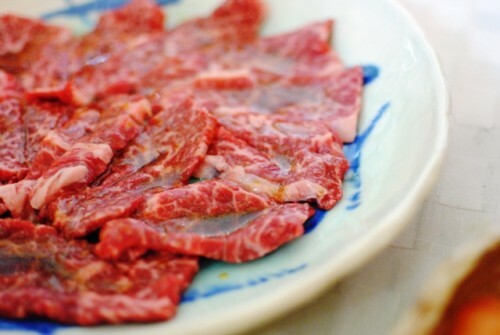 Slightly chewy and very beefy, it was really delicious. 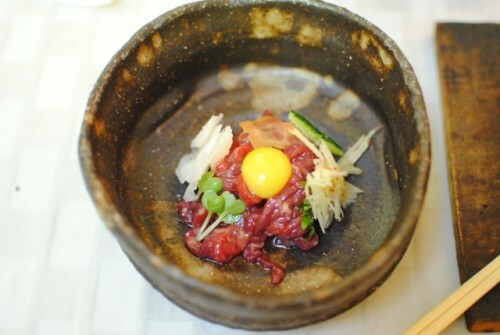 The last raw dish was this one, meant to be stirred. Sesame oil added a slight nuttiness, while the quail egg added an oozy richness. 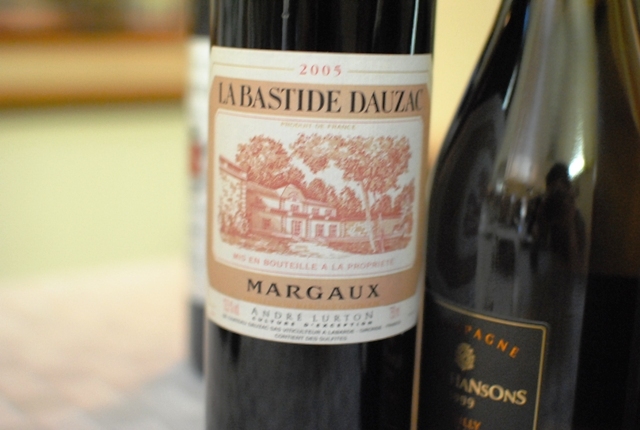 A tasty tartare, for sure. 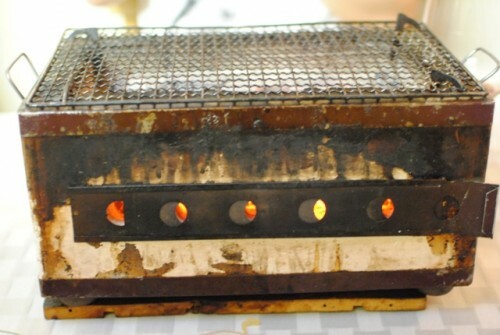 The tableside grills signaled the next stage of the meal. 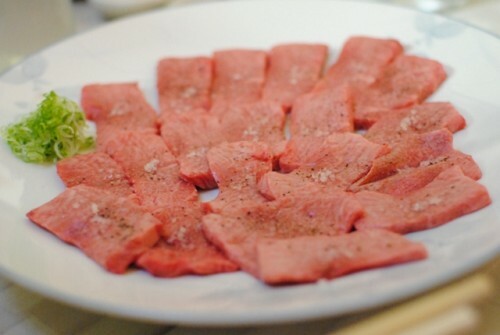 Mmm beef tongue. 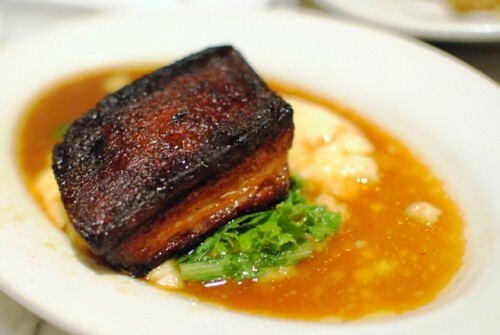 Slightly chewy and tender, really fatty and rich. The marbling was incredible. Seriously good. Surprisingly juicy and full of flavor, this was one of the best variations of the tenderloin I’ve had in a while. 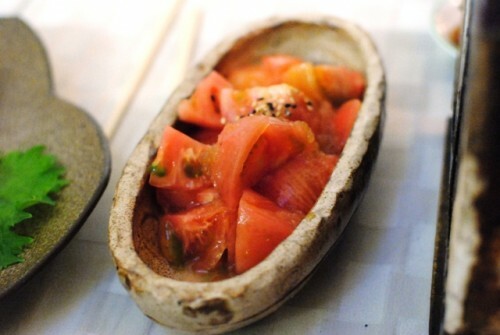 Some raw vegetables and tomatoes were brought out next to help balance out the richness of the beef. Super sweet; some of the best tomatoes I’ve ever had. One of my favorite cuts of the cow is this outside part of the ribeye, much fattier than the inside. As expected, the meat was really juicy, tender and beefy. Although I prefer the outside of the ribeye, the inside is no slouch. 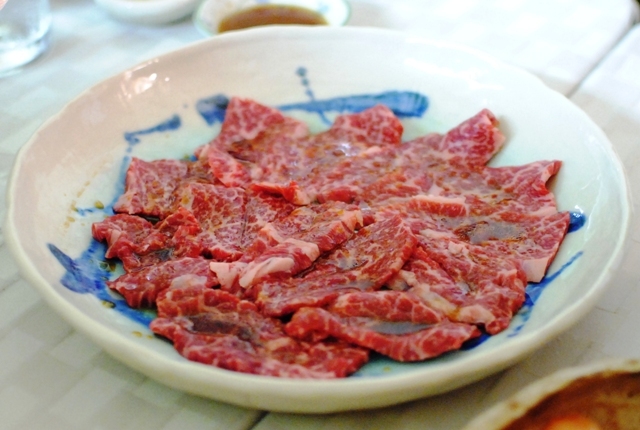 Totaoraku’s meats are all very well-marbled; this inside ribeye was exceedingly tender and really held its own. When I saw the marbling on this meat, I knew it would be good. Amazing. 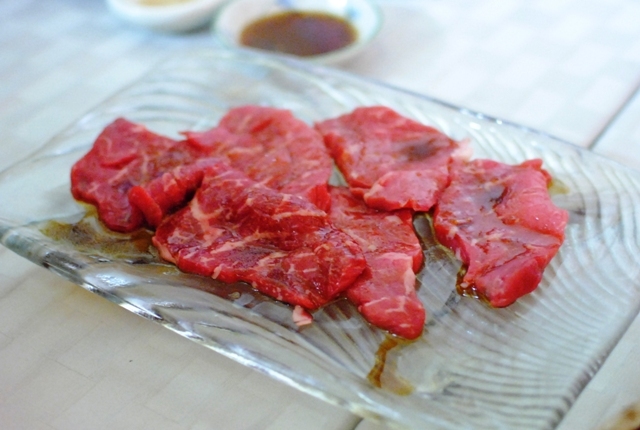 The texture was melt-in-mouth with a sweetness from the marinade. Excessively marbled as well, this was another delicious cut. 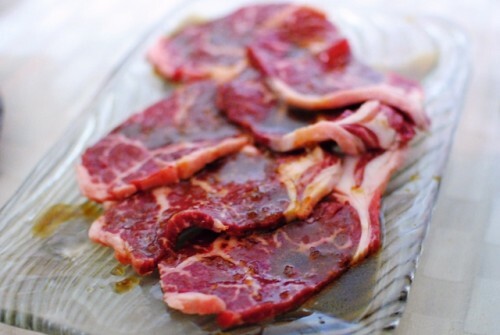 We opted for seconds on a couple of cuts, including the tongue. Both as good as before. 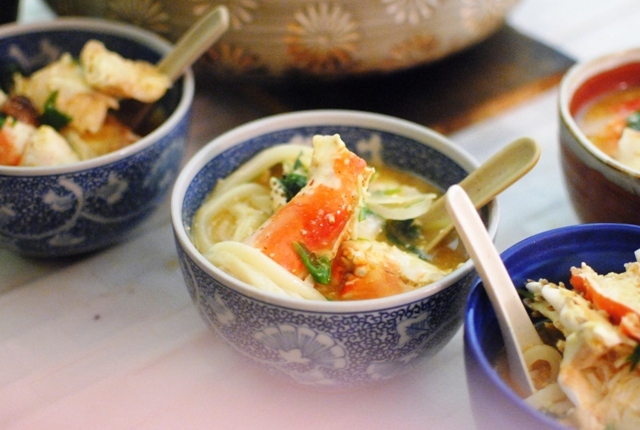 We had the option of two soups, a vegetable-based one and a king crab udon. The choice was easy. 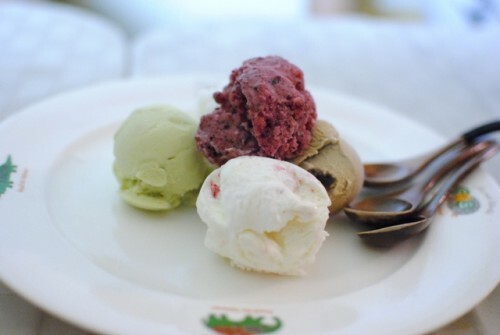 We sampled each of the 5 ice creams/sorbets on offer for dessert. 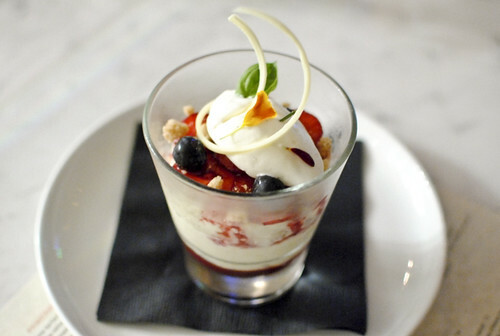 Simple – just something sweet to end the meal with. My favorites were the espresso and pistachio. Lastly, the wines – the six of us each brought one for the meal. This visit to Totoraku was better than my last. I’m not totally sure why since the menu was substantially the same (except the soup). Maybe it was because I barely ate anything during the day. Or maybe because I felt more comfortable around the grill this time. Either way, it was delicious. I don’t hesitate in saying Totoraku serves the best beef I’ve had in LA, in both quality and (especially) in variety. At around $200, it’s quite a splurge. However, I think it’s a worthwhile experience, particularly for the beef lover. I heard about Sushi Nozomi a little while ago but hadn’t had a chance to stop by until now. I’ve read some pretty strong reviews, particularly about the uni. 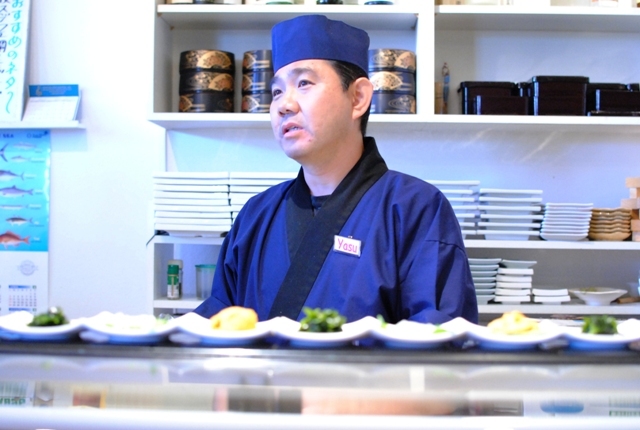 The head sushi chef (Yasu) has a close connection with the boats in Santa Barbara and thus has some of the best uni in the area. 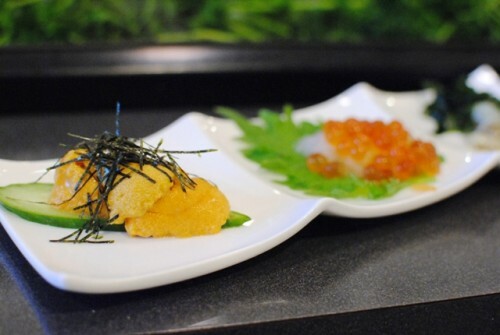 Most of the uni I see is served from a small wooden box. 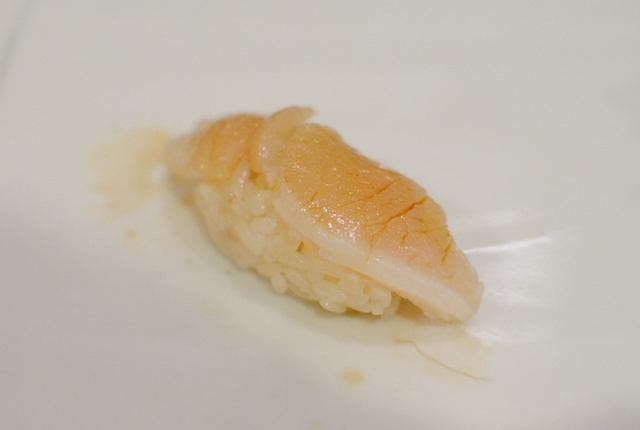 Interestingly, Nozomi’s uni comes out of the back on paper towels, presumably just plucked from the shell. Nice! Danny of Kung Food Panda led the charge to come to Nozomi, actually having visited in the prior week. We settled in for an omakase dinner, setting the price at $80. 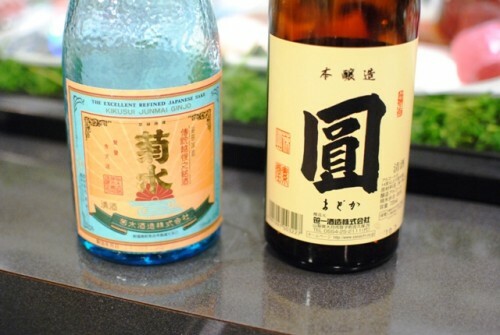 Throughout the night, our alcohol of choice was sake. We started off with an appetizer trio. The squid was deliciously chewy with just a little bit of heat from wasabi, tempered by seaweed. 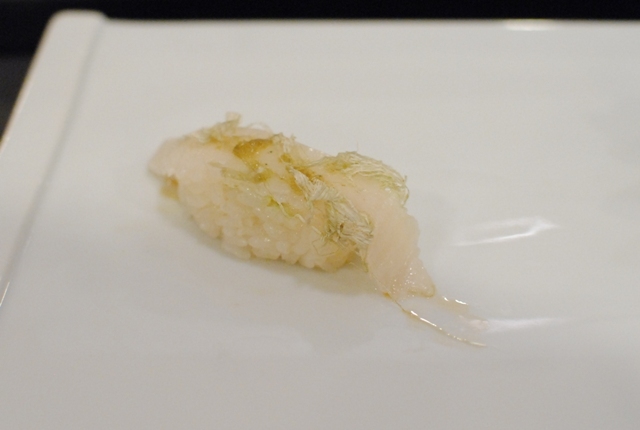 I enjoyed the daikon, grated to a creamy texture, with the saltiness of the roe. Lastly – a look at the uni. 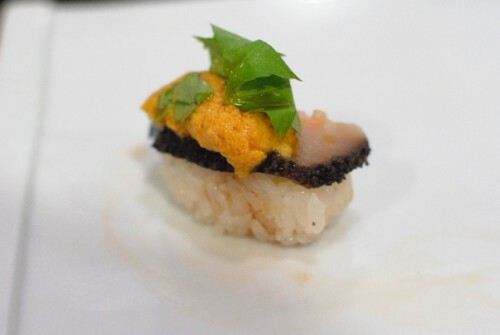 Predictably, it had a clean sea flavor…a very good example of uni. 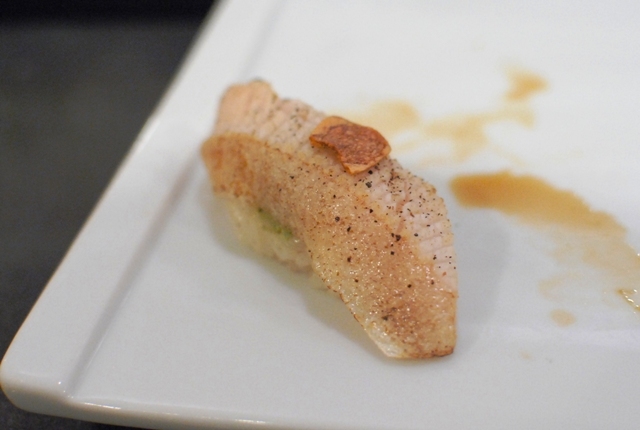 I appreciated the acidity of the yuzu zest, complementing the slightly chewy grouper fish. I don’t think I’ve ever had this before. Crispy cucumber strips added a little bit of texture. 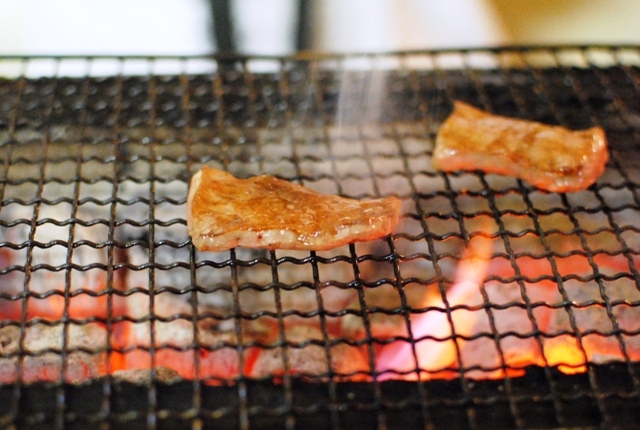 There was also a slight smoky flavor here too. 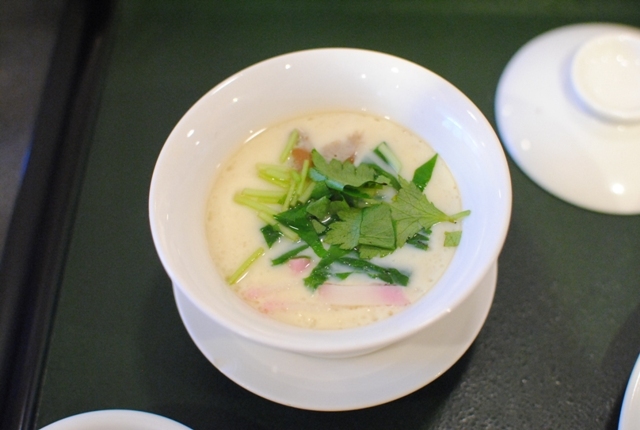 We took a break from sushi for a chawanmushi. This was pretty tasty and well-seasoned, with the earthniness of the mushroom being one of the main flavors in the custard. Some ocean flavors from shrimp and fish cake were also welcome additions. 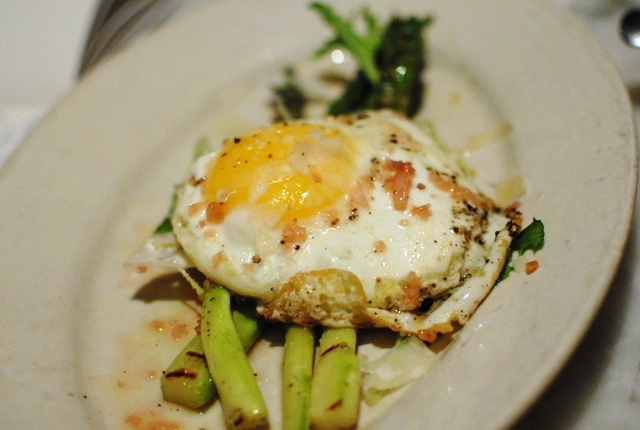 I thought this was done well, though it’s a dish I’ve had dozens of times…and frankly, a little tired of. 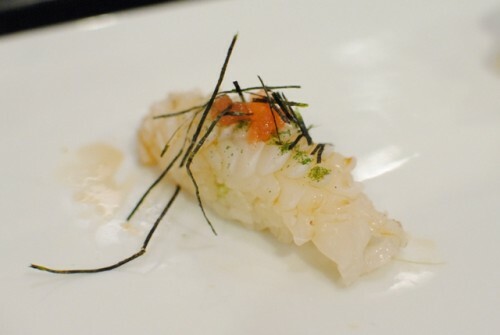 I thought the ponzu jelly was somewhat overpowering here with, interestingly, a salsa-like aftertaste. 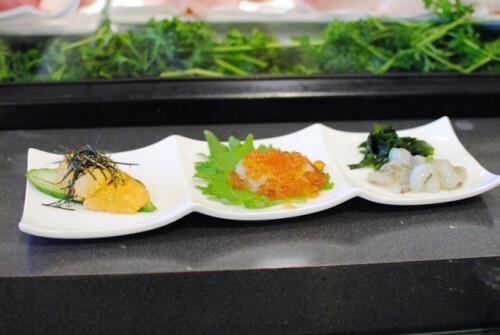 I don’t think I agree with the jelly texture on sushi. 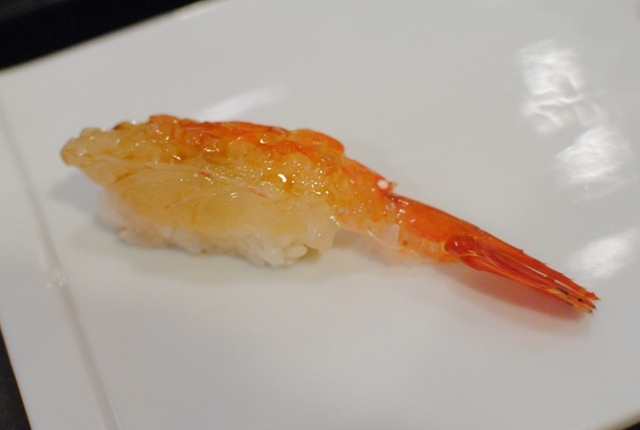 We rebounded with a fine example of sweet shrimp. 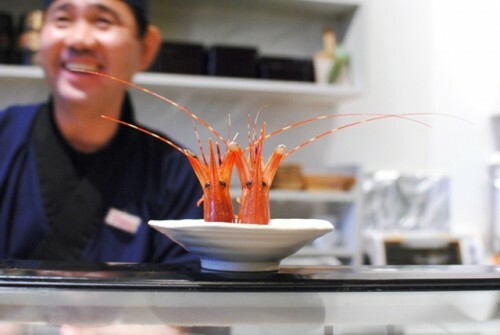 To show how fresh they were, chef Yasu pulled off the heads and displayed them in front of us, still moving. 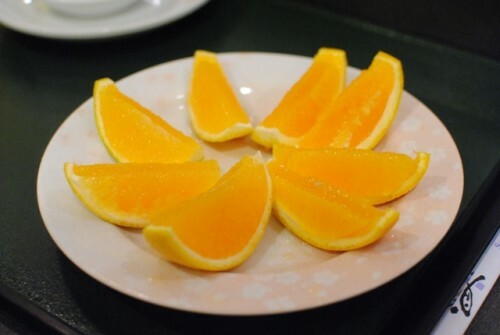 Sweet and spongy, really delicious. Chewy yet still tender, the clam had a subtle fishiness to it. 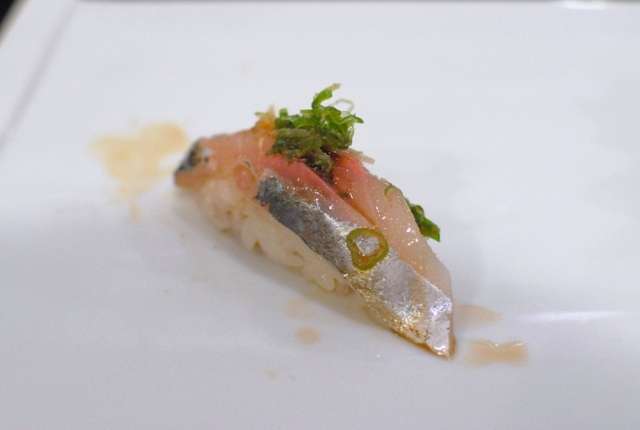 I thought this was really tasty, with the slight chew of the fish and the spicy citrus of the yuzu kosho. 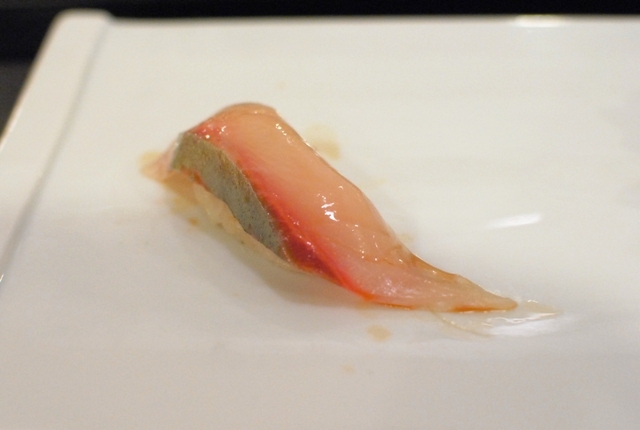 Slightly chewy but still tender, I liked this example of squid. I took this as the adductor muscle (“scallop part”) of the giant clam. 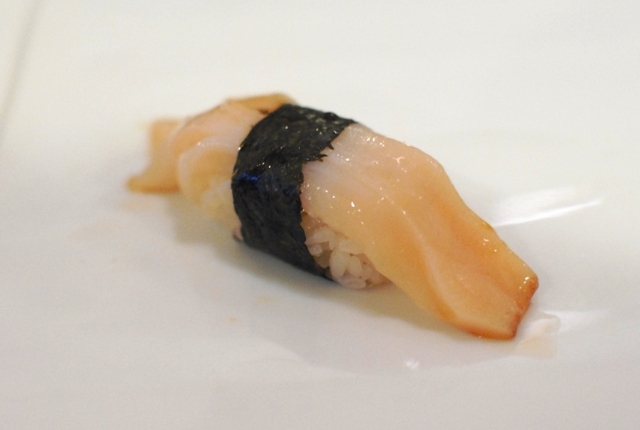 It was really tender, and kind of like an actual scallop, though with a brighter, sweeter flavor. Really nice. Slightly chewy with a clean flavor. 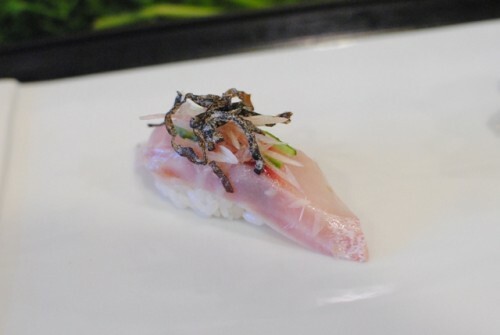 I found this fish to be really tender and flavorful with a welcome green onion accompaniment. 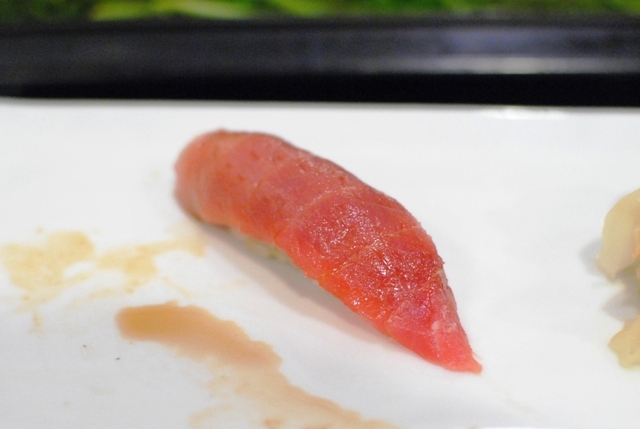 This chutoro was just about melt-in-mouth texture with a rich flavor. The garlic added a new dimension of flavor to the yellowtail belly, which I liked seared here. 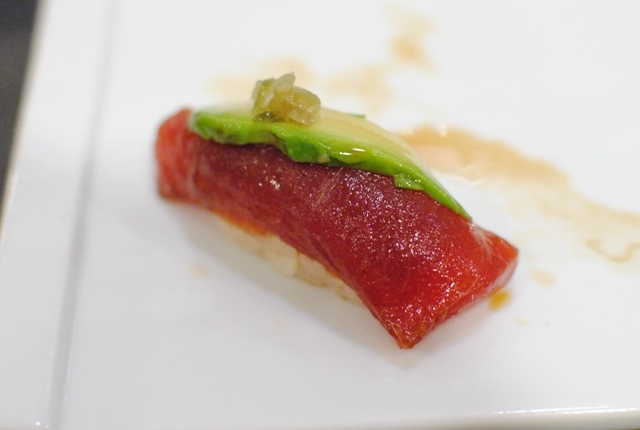 The tuna was just as tender as the avocado, which added a richness and body to the dish. The slight heat of the wasabi was welcome too. 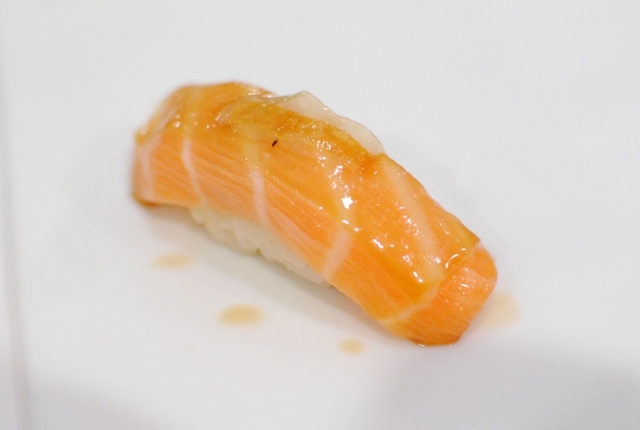 A good example of salmon, though not memorably so. 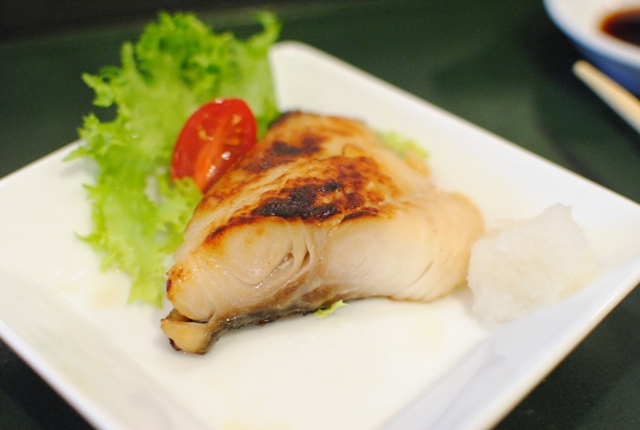 A fine piece of fish, tender, fatty and melt-in-mouth. Pales in comparison to Urasawa’s…but so do most. Sea cucumber! Nice. The cucumber was chewy while the uni was meltingly soft. 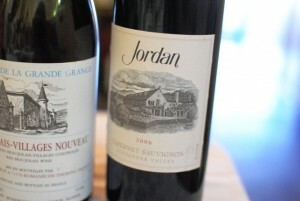 Both flavors were rather subtle, melding pretty well. Remember the shrimp heads that were still moving? 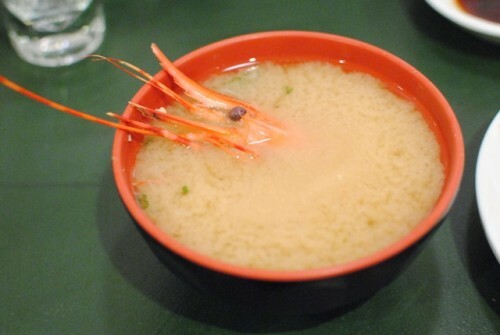 No longer…we found them again in our soup – a good miso soup. Juicy and sweet, definitely a good orange. 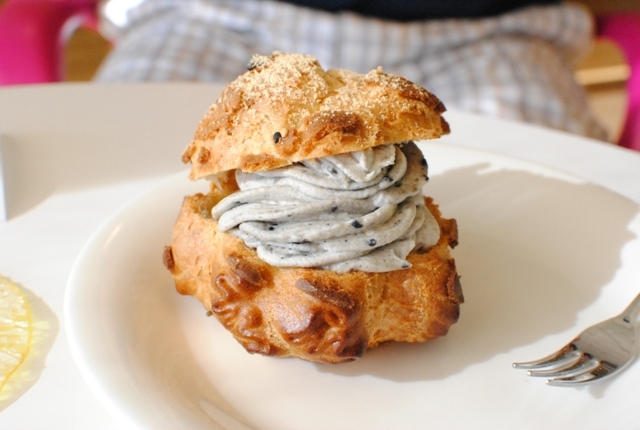 Patisserie Chantilly, located in Lomita, is a patisserie utilizing French technique with a Japanese touch. Yum. Technically, we stopped by Patisserie Chantilly before Nozomi…but I thought it would be the best fit here at the end. I’d been to Chantilly once before and was impressed with the matcha cake; given that we were in the area, a stop was definitely in order. 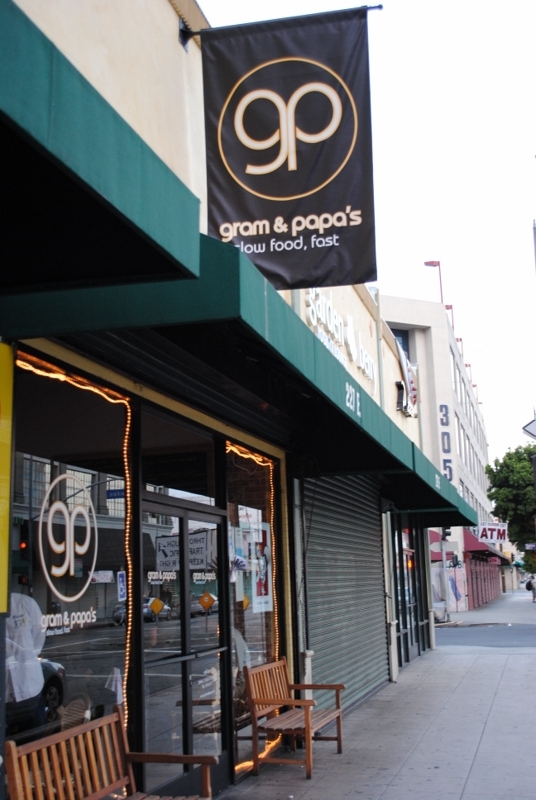 This is probably their most notable item, even being named one of the 99 things to eat in LA before you die by Jonathan Gold. The cream was light, with an impressive depth of sesame flavor. Add to it the crispy, flaky choux pastry, and I could see why it was so popular. 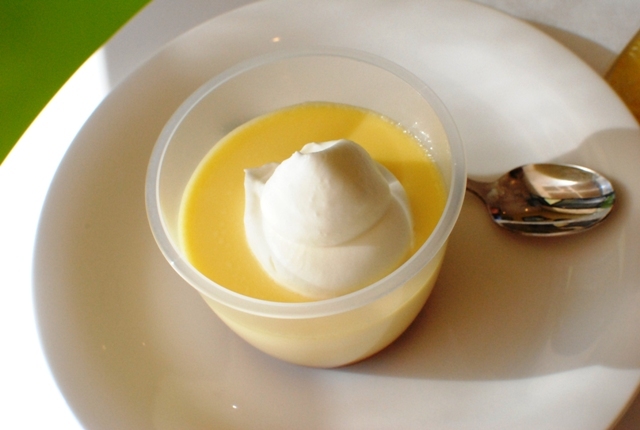 This was a light, eggy custard. A side of caramel added much more flavor. This may have been my favorite item. The flavor was so subtle and the tofu so delicate. 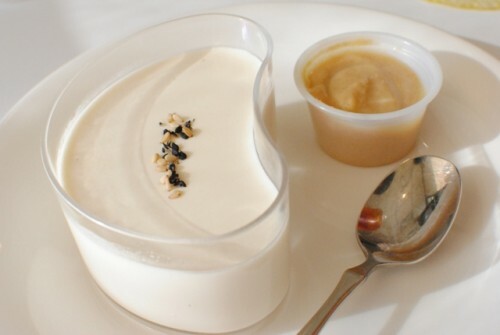 The tofu was silky smooth, while the sesame brought an extra flavor profile. As expected, Patisserie Chantilly was a hit. I enjoyed the combination of French technique with Japanese flavors; the subtlety and finesse of each dessert were both on strong display. Nozomi presented a pretty strong meal. 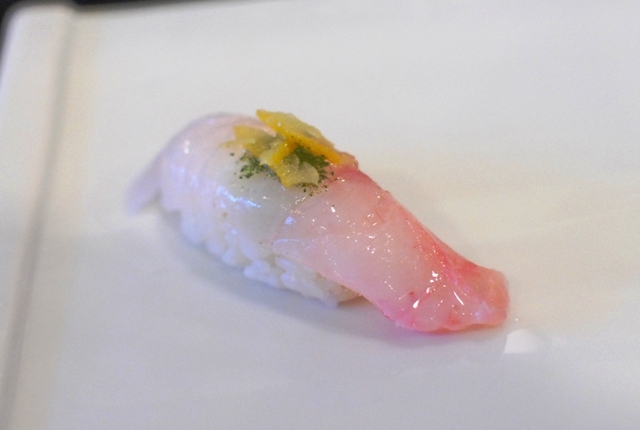 For traditional sushi, it was one of the most topping-creative nigiri presentations I’ve seen in a while (or ever). For the most part, I really enjoyed the different flavor accents this provided. I wouldn’t say this was up to the level of, say, Sushi Zo, but I’d rank it right up there with Mori. 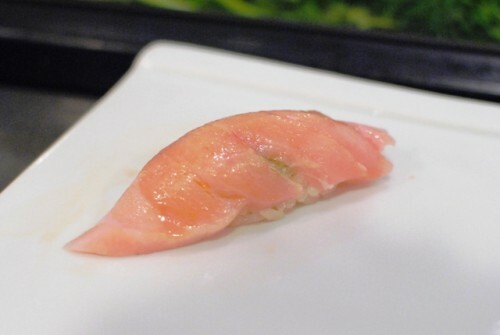 For $80, I think Nozomi presented some pretty good value, as well as an impressive variation of fish for the price point. 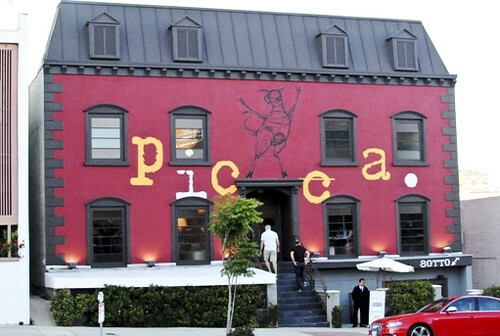 I knew I’d return to Picca soon, but I didn’t think it’d be this soon. Eight days separated this visit from my last (during the Test Kitchen preview), but I was eager to try more of the menu. Add to it the fact that I kept reading positive review after positive review about the restaurant, and a return trip was in order. 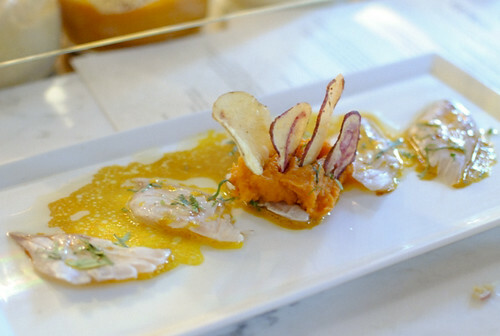 We started with a dish from the primera area of the five-sectioned menu. This dish was pretty rich and savory with the pancetta and aji amarillo butter. 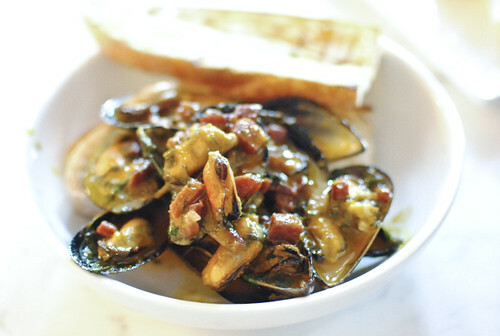 The mussels were nice and plump, and the bread was crucial to mop up the sauce. Tasty. 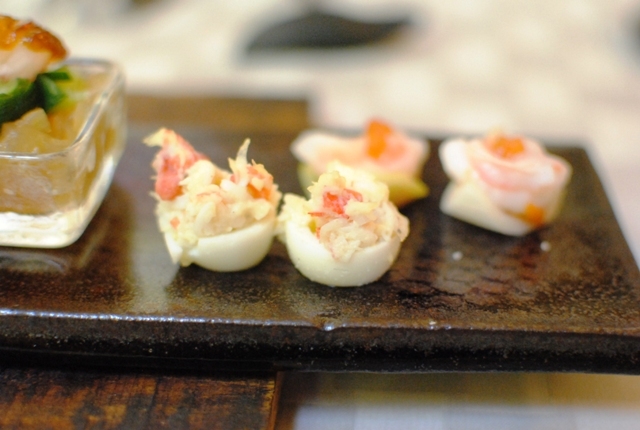 The sushi causa are some of the most fun and playful things on the menu. 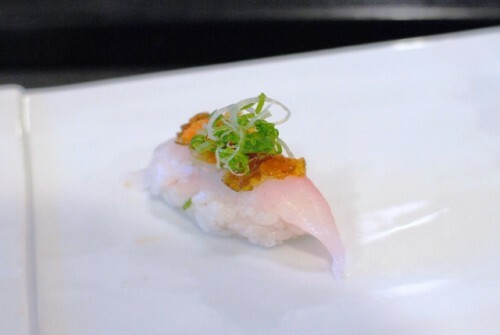 Zarate’s interpretation of nigiri sushi, a soft, creamy potato is used instead of rice. 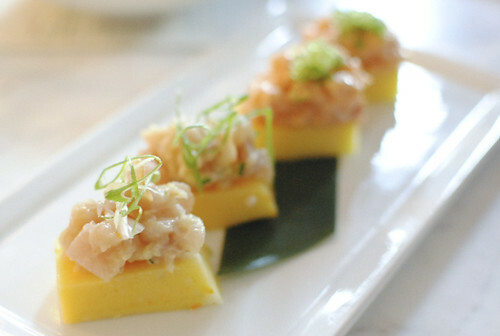 I enjoyed the bright flavors from the albacore and ceviche sauce in this causa, as well as the balanced garlic flavor from the thin chip. 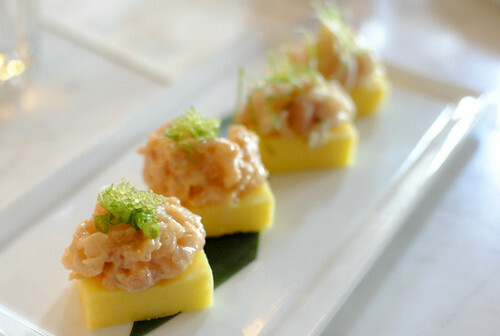 Another good causa here, with the fish getting a little bit of spice from an interesting wasabi tobiko. 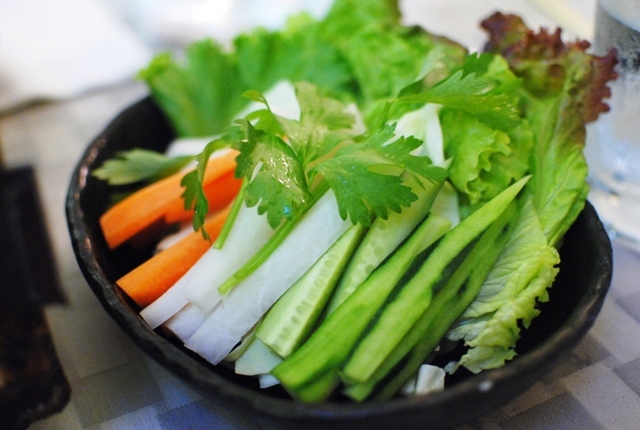 I really liked the addition of the thinly cut green onions as well. 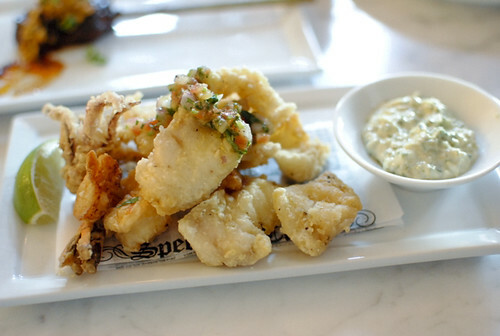 Hard to go wrong with lightly-battered and fried mixed seafood (including shrimp, calamari, sea bass). The lime was instrumental to cut through the fried batter. 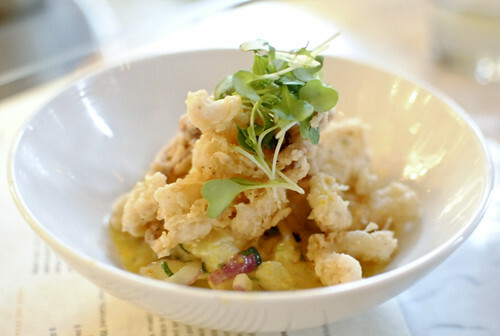 I thought there was an interesting textural interplay in this dish with the fried calamari and tender ceviche. The ceviche was reliably good, while the calamari was solid on its own. 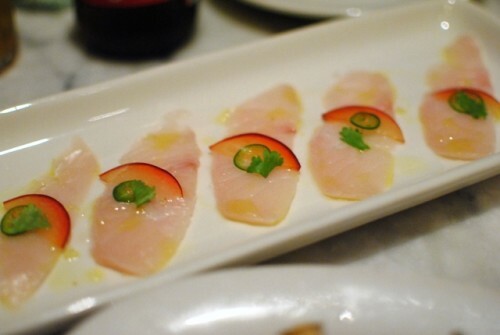 I do, however, probably prefer the ceviche separately, letting the focus stay on the delicate flavors and textures. The fish was briefly seared with a torch, warming the flesh a little bit. The sesame oil and soy gave the dish some Asian flavors, and I thought the sweet potato puree really elevated the dish, adding a rich sweetness. I also appreciated the chip, which added some salt and light texture. 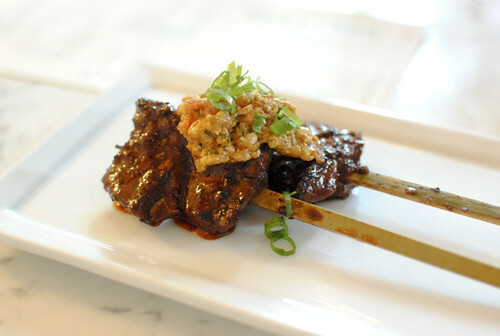 We moved onto the anticucho (grilled meats/vegetables on skewers), perhaps my favorite area of the menu. 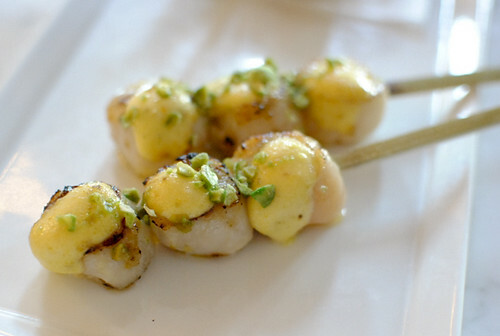 I appreciated the nice char, adding some smokiness to the tender and sweet scallop. I thought the wasabi peas were a really cool way to add some heat and texture. This was a repeat from my last visit and for good reason – it was one of the best bites of that meal. 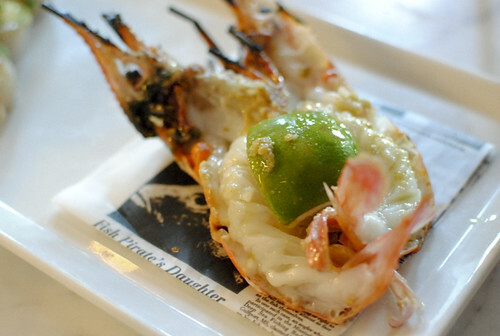 It was just as good this time; a little citrusy heat from the yuzu kosho really heightened the sweet, tasty prawn. 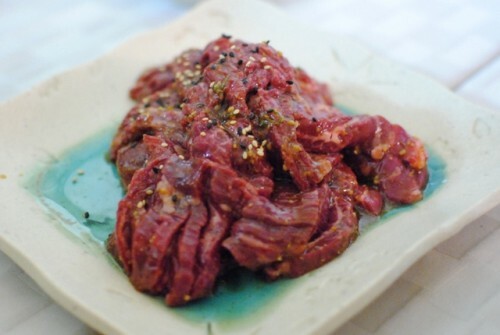 Mmm beef heart. It was slightly chewy, kind of like a bigger chicken heart. The rocoto sauce lended a complementary heat, spicing things up a bit. This was the lone “entree” we ordered. 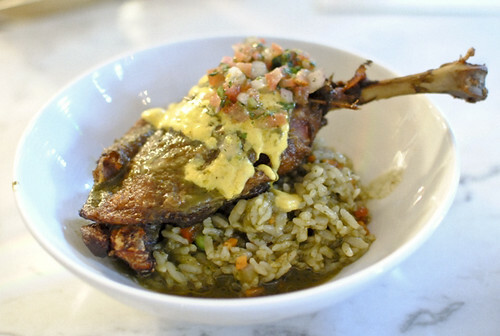 The duck was crispy with a moist interior, though the highlight for me was the really flavorful rice. 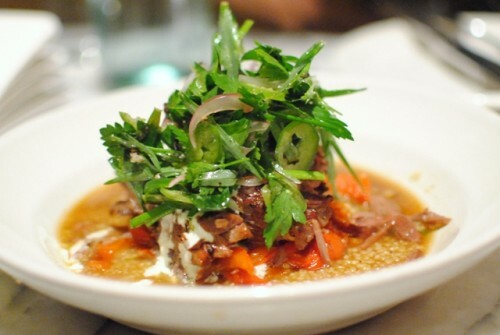 I don’t think it was just cilantro (I’m not sure what was in it), but it was really savory and soul-satisfying, especially with the duck meat. Lastly, we shared one dessert. I enjoyed the light, milky cake, and the fact that it wasn’t too sweet. The food on this visit was just as good as my last visit (which was pretty damn good) and I was happy to see the service was much improved. 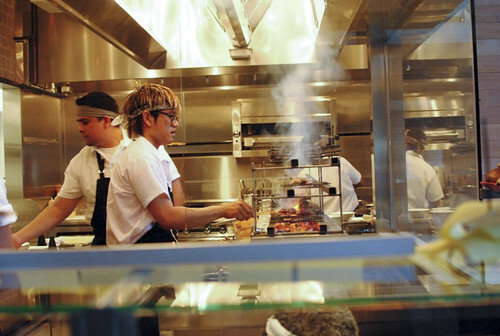 It’s easy to see why the restaurant has been so popular throughout its young life – it’s sort of a modernized, hipper sibling to Mo-Chica. 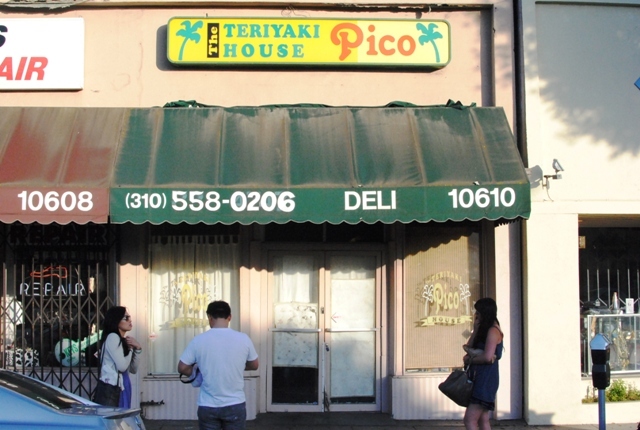 Picca’s food is a welcome change of pace to a lot of the food in LA; Zarate’s cooking is something unique and different, yet still very familiar – exactly why I think it has staying power.